Benny Goodman, one of the first swing bandleaders to achieve widespread fame. Swing music, or simply swing, is a form of popular music developed in the United States that dominated in the 1930s and 1940s. The name swing came from the 'swing feel' where the emphasis is on the off–beat or weaker pulse in the music. Swing bands usually featured soloists who would improvise on the melody over the arrangement. 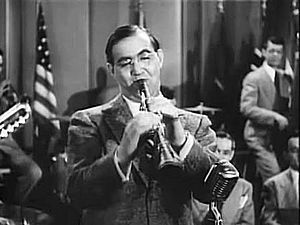 The danceable swing style of big bands and bandleaders such as Benny Goodman was the dominant form of American popular music from 1935 to 1946, a period known as the swing era. The verb "to swing" is also used as a term of praise for playing that has a strong groove or drive. Notable musicians of the swing era include Louis Armstrong, Duke Ellington, Count Basie, Benny Goodman, Artie Shaw, Glenn Miller, Woody Herman, Tommy Dorsey, Jimmy Dorsey, Harry James, Louis Jordan, and Cab Calloway. Swing has roots in the 1920s as larger dance music ensembles began using new styles of written arrangements incorporating rhythmic innovations pioneered by Louis Armstrong and Earl Hines. A typical song played in swing style would feature a strong, anchoring rhythm section in support of more loosely tied wind and brass. The most common style consisted of theme choruses and choruses with improvised solos within the framework of his bandmates playing support. Swing music began to decline in popularity during World War II because of several factors. Swing influenced the later styles of traditional pop music, jump blues, and bebop jazz. Swing music saw a revival in the late 1950s and 1960s with the resurgent Count Basie and Duke Ellington orchestras, and with pop vocalists such as Frank Sinatra and Nat King Cole. Swing blended with other genres to create new music styles. In country music, artists such as Jimmie Rodgers, Moon Mullican and Bob Wills introduced many elements of swing along with blues to create a genre called western swing. Gypsy swing is an outgrowth of Venuti and Lang's jazz violin swing. Swing revivals have occurred periodically from the late 1960s to the 2000s. In the late-1980s (into the early 1990s) a trendier, more urban-styled swing-beat emerged called new jack swing, spearheaded by Teddy Riley. In the late 1990s and into the 2000s there was a swing revival, led by Squirrel Nut Zippers, Brian Setzer, Big Bad Voodoo Daddy, and Lavay Smith. In Canada, some of the early 2000s records by The JW-Jones Blues Band included swing revival elements. Swing music Facts for Kids. Kiddle Encyclopedia.